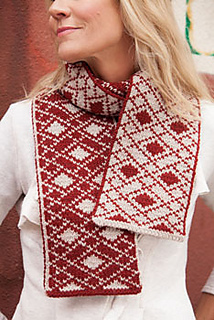 The Trimble Court Scarf plays classic red and white against each other in a double-knit colorwork pattern. 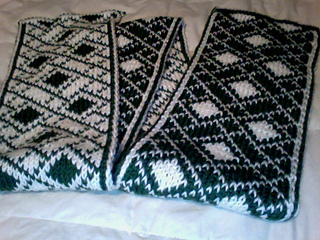 Finished Size 6½“ wide and 63” long. Yarn Brown Sheep Company Nature Spun Worsted (100% wool; 245 yd [224 m]/1¾ oz 100 g): #720W ash (A) and #146W pomegranate (B), 2 balls each. Needles Size 5 (3.75 mm): straights and 16” circular (cir). Adjust needle size if necessary to obtain the correct gauge. Gauge 16½ sts and 24 rows = 4” in double knitting patt.